Project selection deadline is July 27, 2018. 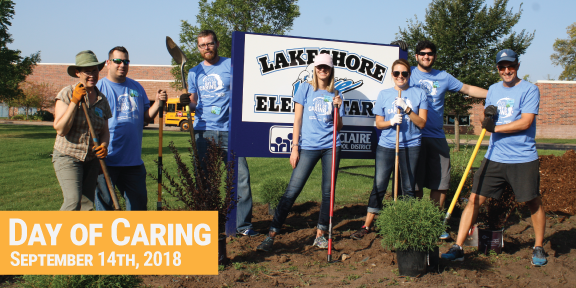 Click below to review the Day of Caring Project list. Choose 3 projects your team would be interested in that is appropriate based on the size of your team and the time frame. New projects are added regularly, so check back if you don't find something right for you. Fill out and submit the online project selection form. MAKE SURE TO ENTER THREE PROJECT OPTIONS. Recruit members of your volunteer group. Fill out and turn in your Project Selection Form for your team by Friday, July 27th. Ensure that all members of your group register for the event by Friday, August 17th. Be primary point of contact with both our United Way and with the Project Coordinator for the project your team is assigned. Comunicate information about Day of Caring with the members of your volunteer group. Please review the Day of Caring Project List carefully. This list will identify the approximate number of volunteers needed, what the project entails, and where the project will be. PLEASE NOTE: PROJECTS IN RED REQUIRE SPECIAL SKILLS/PHYSICAL REQUIREMENTS AND/OR EQUIPMENT. Please only sign up for a project in red if your team can meet those requirements. On the Project Selection Form, you will be able to list your top 3 choices for projects. We will do our best to match you and/or your team with your preferred project. Projects are selected on a first-come basis, with consideration given to appropriateness of teams for location. Our goal is for Team Leaders/individual volunteers to receive confirmation of project assignments by Wednesday, August 22nd. Contact Rebecca Baader via e-mail at rbaader@uwgcv.org or by phone at 715-834-5043 should you have any questions.